There are so many Halloween activities for families with small children in the Atlanta area. In order to help you sort them all out, we put together a list of kid-friendly Halloween activities we think you should check out with your kiddos this year. Here is a list of 11 things in and around Atlanta, Georgia worth checking out for a spooktacular time, in no particular order. Experience the spooky sights and sounds of Halloween during the Haunted Hall of Fame at the Chick-fil-A College Football Hall of Fame in downtown Atlanta! Kids ages 3 to 12 get in free when they arrive in costume. Run around the field of screams, dodge ghosts in our Skillzone challenge, trick or treat, visit our face painters and more! Boo at the Zoo has tons of kid-friendly activities with Zoo Boo Town, pumpkin carvings, train rides, storybook character meet-and-greets, an inflatable corn maze, and more. Watch as animals are fed their special Halloween treats and don’t forget your costume! Join them on evenings in October for this bewitchingly fun special event series featuring evening hours of the new outdoor experience, Woodland Spirits, as well as musical entertainment and hands-on activities for all ages. Drinks, including adult beverages, and a variety of snacks will be available for purchase. 4. Dinosaur Trick-or-Treat, also at the Fernbank Museum on Saturday, October 27th, from 10:00 AM 2:00 PM complete with games, activities and special treats for kids in costumes. You can also do the monster mash at the kiddie dance party and get up close and personal with a life-size replica of a Giganotosaurus skull. Stone Mountain Park’s annual Pumpkin Festival has become a family favorite with kids and parents alike! Enjoy park attractions, fun-filled games, live shows, and more! After dark, there is a new family-friendly nighttime experience featuring thousands of carved jack-o-lanterns lighting up each night. Enjoy breathtaking views from 2,000 feet above on a tethered balloon ride, or if you’d prefer to stay on the ground, this Kennesaw festival features seven stages of concerts, aerial performances, a costume catwalk contest, and much more. Enjoy with trick-or-treating, kid-friendly ghost encounters, tasty bites and haunted houses. 8. 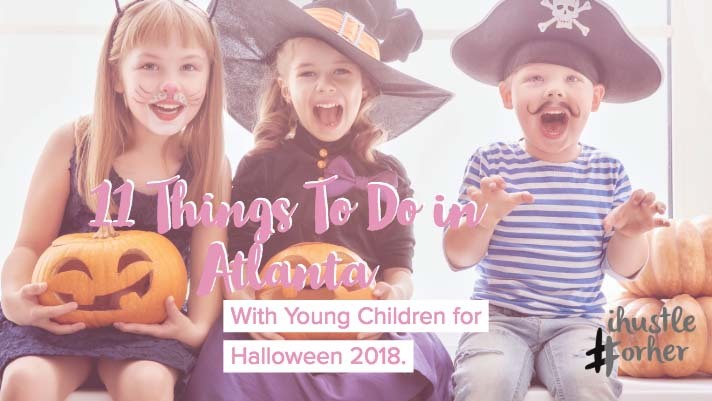 The Children’s Museum of Atlanta is celebrating Halloween with four days (October 27th - 30th) of themed programming including crafts, story times, experiments and music. And, don't forget to visit in costume on October 27 for trick-or-treating throughout the museum. 10. Goblins in the Garden at Atlanta Botanical Gardens on Sunday, October 28th, 10 AM – 4 PM. Show off the kids’ Halloween costumes on the Goblin Runway, make fall-themed crafts, enjoy a storyteller and ride a pony or a train. There’s even a cash bar for adult goblins! 11. Avalon Trick or treat October 31st Avalon celebrate Halloween in style this year with a safe trick-or-treating experience throughout Avalon Boulevard. Pick up a map from the concierge and visit participating retailers, who will hand out candy and goodies throughout the day.